In keeping with its established product innovation cycle, Korean manufacturer Samsung has today launched the latest model in its Note line of large format smartphones, the Galaxy Note 7. Judging by its specifications the new device looks like an impressive package but is in many ways more of a refinement of previous models rather than a radical overhaul. The camera module, for example, comes with the same specification as the smaller Galaxy S7 and S7 edge devices. A 1/2.5″ 12MP sensor with 1.4-micron pixel size is combined with a fast F1.7 aperture, optical image stabilization and dual pixel on-sensor phase detection AF. The front camera has a 5MP sensor and F1.7 aperture. Processing specifications are identical to the S7 as well. The US version of the device is powered by a Qualcomm Snapdragon 820 chipset while the international versions will come with Samsung’s own Exynos octa-core chip. All models come with 4GB of RAM and 64GB of internal storage that is expandable via a microSD-slot. 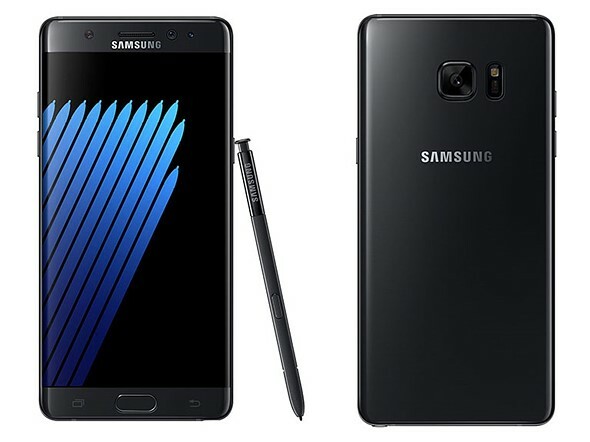 The Note 7’s characteristic dual-edge display offers Super AMOLED technology and a 2560 x 1440 Quad-HD resolution. It’s also the first display to feature Gorilla Glass 5 which should survive a drop from 1.6 meters height. As on the predecessor, the edges of the display are curved and offer Samsung’s unique Edge interface for quick access to contacts and apps. While some competitors have started to dispense with the headphone-jack the Samsung still offers this standard connector, next to a new USB Type-C port. All the components are powered by a 3,500mAh battery, which is a little smaller than the variant in the S7 Edge. Notable new features include an iris scanner above the display that allows you to unlock the phone or access secured content. Samsung says that in the future the scanner will let you log into accounts or use Samsung Pay, but none of these functions are currently implemented. The design of the Note series’ characteristic S-Pen stylus has been slightly altered, too. It is now water-resistant and at 0.7mm comes with a thinner tip which should make for a more natural writing experience. Overall the Galaxy Note 7 looks like an appealing proposition for those users who like to work with larger screens and a stylus for photo editing. The camera module has already been tried and tested on the Galaxy S7 models and currently among the very best.